I'll be the first to admit that this was a real experiment with flavours. I'd been thinking of all the things that I would like to go with duck, and instead of choosing just one, I put them all together to create this exciting new dish. Everything works, the flavours and textures are complimentary, and it looks elegant! Top tip: The juices from the meat act as a delicious salad dressing, but don't be scared to use the juices from the pan to top up this dressing. 1. Cube the beetroot into 1 cm square pieces. Drizzle over the balsamic vinegar and allow to soak. 2. Marinade the duck breasts by rubbing crushed garlic into them, and then coating well with the Teriyaki glaze. Leave to marinade in the fridge for a minimum of 30 minutes. 3. Trim and then slice the spring onions lengthways. Prepare the salad on the plate, using the spring onions, watercress and roughly chopped coriander to create a central island. Sprinkle over the pomegranate seeds, and lay a ring of alfafa around the plate. 4. Slice the round of goat's cheese in half horizontally, and place the two circles under a medium grill for a few minutes until just browned. 5. Meanwhile, in a non-stick frying pan, heat the oil and place the duck breasts skin-side-down to begin with, and fry on each side for roughly 4 minutes. The center of the breasts should remain pink, and the outside should be nicely seared with the glaze. 6. 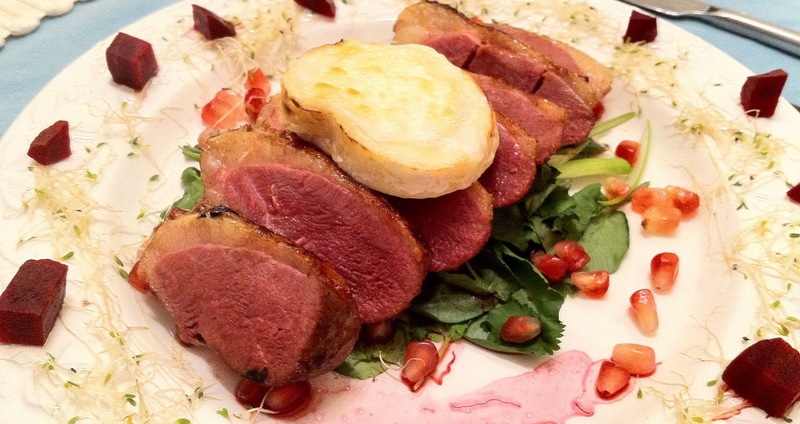 Slice the duck breasts in an oblique fashion and lay on your salad islands. Place the goat's cheese on top. Drain the beetroot well, and place the squares in a ring around the edge of the plate.